We all know there are some big Youtube channels out there. Some even have more subscribers than the total population of their country. Do you know all 10 of these youtube channels? Do any of them live near you? There are as many gaming channels as comedy channels in the Top 10, there are four gaming channels and four comedy channels. Only 2 out of top 10 youtubers are female. Almost half, 4 out of 10, of the 10 most popular youtubers are Spanish channels. 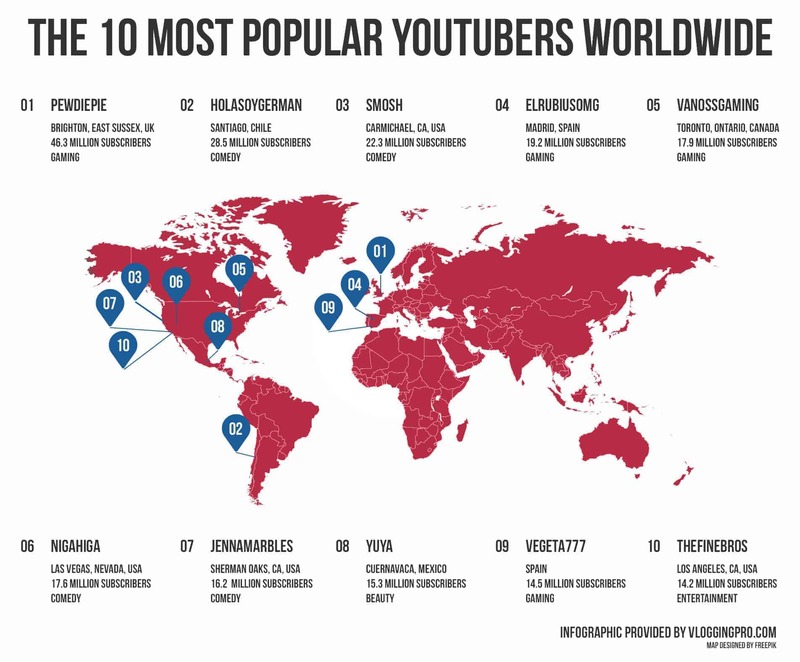 Number 2 of this list, HolaSoyGerman, has more Youtube subscribers than the total population of his country. He has 28.5 million subscribers while the total population of Chile is 18.2 million people. The most recently created channel in this top 10 is elRubiusOMG, he started his channel December 20th, 2011. 6.5 years after Youtube was created. The earliest created channel in this top 10 is Smosh, the channel was started on November 19th, 2005. Only 278 days after Youtube was created. Number 1 channel PewDiePie also has the most video views: 12.7 Billion. If you divide that number by the entire population on earth, every person on this planet has, on average, watched 1.71 PewDiePie videos. Number 9 of this list, Vegeta777, has created the most videos of the top 10 youtubers. He has uploaded 3,106 videos. Number 2 of this list, HolaSoyGerman, has created the least amount of videos of this top 10. He has uploaded only 136 videos. That amounts to just under 210.000 new subscribers per video on average. Want to start your own Youtube channel? Check our Getting Started section for more information on how to start and grow your Youtube channel.